Portland Pest Control Company using Sustainable, Organic, Natural and Green methods for rodent control and to safely exterminate pests. 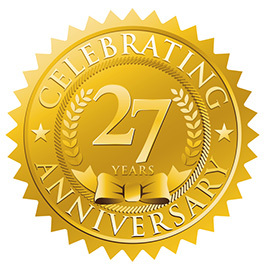 27 Years ago, we named our company Nature First Pest Control because we knew that our friends and neighbors were looking for a green and more organic choice in pest control services. We took a different path than the rest of the industry. While there were many commercial accounts that required long term programs with monthly visits, most homeowners in the Portland area really did not need that type of service. The treatment methods that were the industry standard in most of the country were literally overkill for pest control in Oregon. We embraced the idea that spraying anything is always the last step in a thoughtful process that starts with asking the right questions. First we identify, and when possible, fix the environmental reasons for your pest problem. On this site you will find dozens of conditions discussed that contribute to, or directly cause, insect and rodent problems. You will find that we are knowledgeable, helpful, and patient when we give you information and advice about your situation. When necessary to protect you, your pets and property, we may use products that are on the “Low Impact Pesticide List” and the “Reduced Risk List”. The pest control industry has made huge advances in the safety and efficacy of products approved for home use. We now know so much more about the biology and relationships between insects, rodents, and the eco systems that we are all a part of. As an example, building a home on what was a bare field, creates a micro climate that encourages some pests, and discourages others. 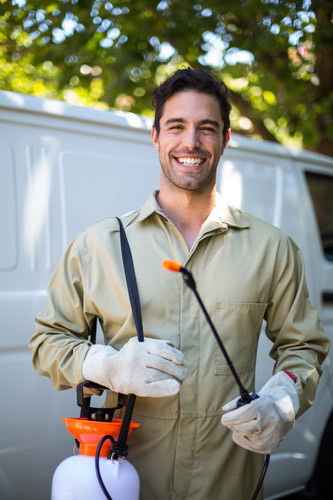 Every property we service is unique, and so is our pest treatments. If you see a pest truck drive up with a big tank and spray rig, you can bet that almost all their customers get the same spray, in the same concentrations, in the same ways. That is very efficient and cost saving, to the other company. Our equipment of choice is a one-gallon hand sprayer, not two hundred gallons of the same mix for everyone. If we spray the foundation of your house, we do not want to force the insects that are already inside to stay inside. We will use products on your foundation that the insects will not detect. Insects freely walk across our treated areas. In this way we achieve a much bigger impact on insect populations than with traditional treatments. And, with a lot less product use. 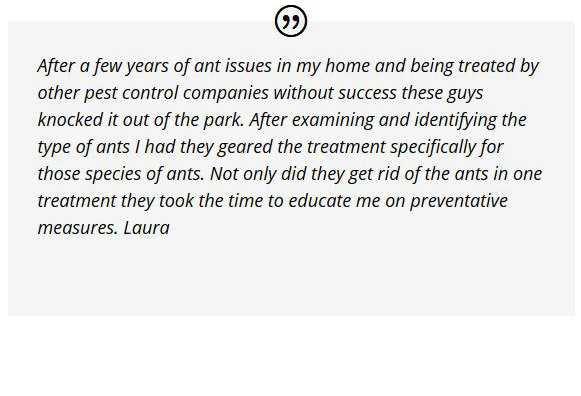 Common sense is the most valuable tool in natural pest control, and it isn’t so common. You must be a detective to be a good pest control technician in this area. A one size fits all approach is not sufficient here. Fall in Oregon brings out the most aggressive behavior from bees and wasps. These nests are at their largest and the workers and guards are very aggressively defending their territories. Wasps are traveling long distances to hunt for protein to raise new queens for next year. These yellow jacket queens will hide over winter and start totally new nests next year. Destroying wasp nests now will prevent some new nests near that location next year. We have observed two new pest invaders arrive in Portland over the past 27 years. Odorous house ants have invaded to the extent that they have displaced most of the native carpenter ant species. These pests are hard to eliminate, and they require a whole green approach for ant pest control to exterminate them. Roof rats arrived in Portland a few years ago and have become a huge control issue. Roof rats often use the holes that squirrels have opened on your roof. If you have an insect, pest or rodent control problem in Portland we will solve it. Guaranteed! Call for a Free Estimate! Portland rodent control requires great detective skills when using green extermination and control methods. We often crawl around a house on hands and knees to locate all the rodent entry points. 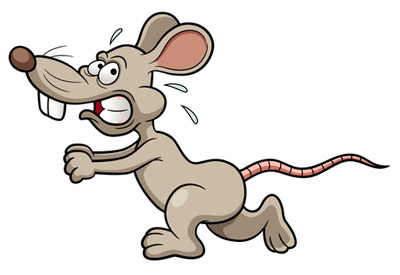 Denying rats and mice an entry to your structures, is the first and most crucial step in eliminating them. 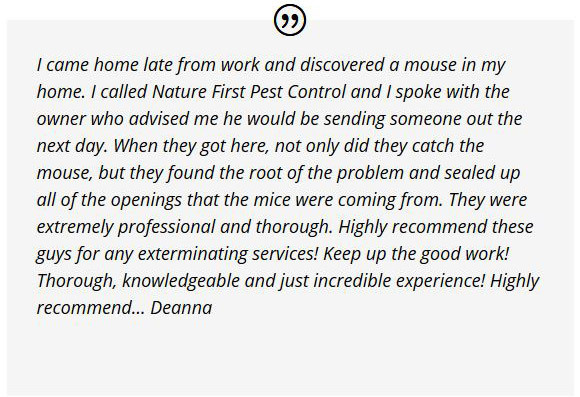 This painstaking inspection process helps us provide natural, pet safe, rat and mouse control and extermination. We are the only Portland Exterminators to guarantee the results for one year! We offer “NO POISON” total rodent control with long term warranties. We never put poison bait boxes around your house. This is a temporary band aid to a much more serious problem. We use contraceptives, instead of poisons, combined with a new humane trap system to control the rat population explosion. Stay away from any pest company that puts out bait and assures you that the rodents will leave your house and go to water. This is total BS. We use no bait. We seal the entry points, trap the invaders. We offer crawl space cleaning and repair services for our customers who have discovered that rats and mice have damaged their crawlspaces and attics. Nature First always inspects the attic of a home with a rat problem. We know that a rat or mouse invasion in the basement makes it likely that we will find the attic insulation has also been damaged. Department of Agriculture AG-L0073581CPO, CCB#207725, An Established leader in Natural Pest management. We strive to ‘exterminate’ naturally.